Please write your hotel name, Hawaii address, or the Cruise Ship Name and Pier Number. Your exact pick-up location and time will be provided with your confirmation. If you’re looking for the Pearl Harbor tour that has it all, look no further. The Pearl Harbor Memorial Tour visits all of the tourist sites at Pearl Harbor and includes all admissions. It’s the most complete tour to the Pearl Harbor Memorials. Begin by visiting the World War II Valor in the Pacific National Monument Pearl Harbor Visitor Center, where you can explore the exhibit galleries “Road to War” and “Attack”. There are interactive exhibits in these galleries. You will also watch a 23-minute documentary film about the Pearl Harbor attack. Next, board the US Navy shuttle boat to the USS Arizona Memorial where you will see the shrine room with the names of those who lost their lives on the Arizona. Aboard the Bowfin submarine, you will see the living conditions that our tough submariners endured as they made a major contribution to the costly victory. After learning about the subsurface war effort, visit the Pacific Aviation Museum to learn about the airborne side of the war. Ranked one of the top 10 aviation museums in the country, the two hangars and the Ford Island control towers are not to be missed. While on Ford Island, you will tour another important Pearl Harbor memorial: the Battleship Missouri. This is the last battleship ever built and her stories will fascinate you as your guide walks you above and below the decks. 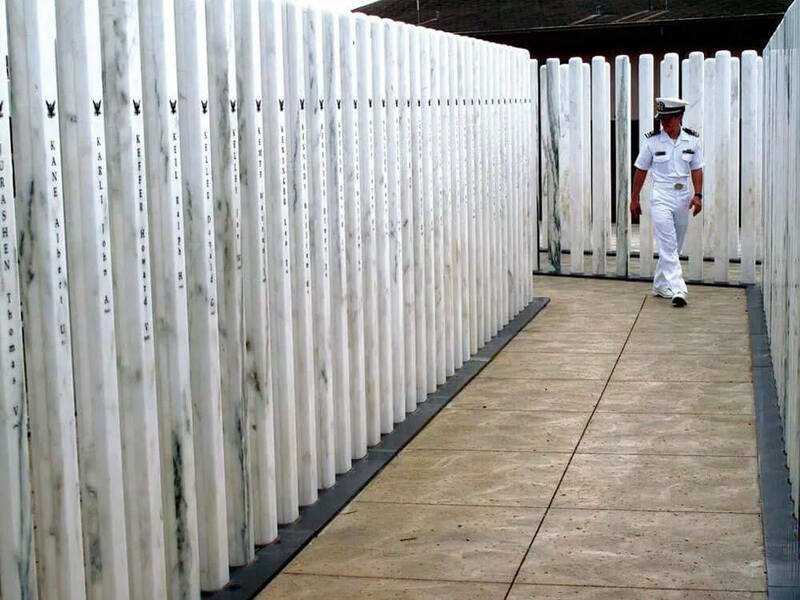 Outside of the Missouri is the USS Oklahoma Memorial honoring the 429 men who lost their lives in the 1941 attack on Pearl Harbor. After your visit to Pearl Harbor, enjoy the Honolulu City Tour and experience historic sites like ‘Iolani palace, the King Kamehameha Statue, and the Hawaii State Capitol Building. Punchbowl National Cemetery of the Pacific is a volcanic crater that is a memorial cemetery. You will drive inside the beautiful and solemn crater. Upgrade your Pearl Harbor experience with lunch at the Laniakea Café, located inside the Pacific Aviation Museum. A no-host lunch stop will be scheduled at a Pearl Harbor restaurant. For a deluxe tour with lunch and snacks included, see Beyond the Call to Duty Tour. We went to the Pearl Harbor National Monument for the morning, out last trip here was 30 years ago. I had similar feelings that I experienced the first time we visited. The is a great opportunity to understand a little about history and the impact on their lives. Very well done and a must visit in Hawaii, truly an emotional experience. This is a well laid out attraction and if you have traveled all the way to Hawaii from England it is somewhere that is worth a visit. It is an overwhelming experience. We were there during Pearl Harbor Week and were able to meet two of the survivors. It’s indescribable. This is a very well organized place to visit and to pay respect to the lost souls on the faithful day of December 11, 1941. What else can I say but Thank you to the brave men who gave it all. This place is a great reminder of why we enjoy our everyday freedoms because good men laid down their lives. This is a great Museum and tribute to those who died in the war in the Pacific. The displays give lots of information of the events leading up to and after the bombing. What a great place that shows the respect and honor WW11 veterans deserve and earned. Bring your family and teach them about the ones who came before and paved the way to our future. We recently visited Pearl Harbor, including the tour of the Arizona Memorial. I’m so thankful we were able to experience this. If you’ve watched the movies and read the books about the WW II war in the Pacific. This will definitely bring those stories to life. I am forever grateful to the brave men and women who served and are serving in our military. The memorials for the submariners and those ships that still lay at the bottom of Pearl Harbor will give you a sober feeling and an appreciation for the freedom we have. A moving experience making the past real sense of losing life a reality when you read the death roll. I had not been to see the memorial for 50 years , when I was nine years old. Even though I was on a West Coast Aircraft Carrier that would stop at Pearl Harbor, on our way to another cruise, or on our way back to San Diego. Everyone should make a point to visit pearl harbor, very overwhelming place and a true history lesson. You can’t not visit whilst on Oahu. It’s full of history, compassion and if you don’t you will be at a loss! This is a piece of history that I feel must be done on your trip to Oahu. Its very informative and an excellent part of American history! My husband and I went to see the Pearl Harbor memorial; special since we were in Oahu over December 7th. There were over thirty remembrance wreaths on stands all over the memorial. The memorial itself is very emotional, particularly the portion explaining that survivors of the USS Arizona are allowed to be interred within when they pass away, so that they can join their crewmen again. Pearl Harbor can’t be missed. This is a must see place while in Hawaii. The overall feeling of reverence takes over your body. The Arizona memorial is amazing. Full of history and reflection. A place to realize just what those servicemen and women endured. Very humbling experience. One of my fav days in Waikiki was our visit to Pearl Harbor. An amazing place with so much history. The visit is so worthwhile and a memorable experience. We were escorted to the entry area and Arizona Memorial. The whole tour is professionally dealt with and groups are guided through quickly and efficiently. It was very touching. Lots to see and do. The site also has plaques indicating all the events leading up to the Pearl Harbor invasion, all the events on the night in Dec.1941 and the events which followed. There is also a large plaque with all the names of the heroes who lost their lives in that disaster. Was very interesting and sad to see the ship. Was great to learn about the history behind the event. The video was great. The museums were fairly interesting. The video was educational and walking through the USS Missouri was cool. My boyfriend dragged me here as I am not a fan of anything war related…he loved it while I was not too interested. Even though I wasn’t positive about it, I found it educating. I found it a little ordinary to be honest, but the exhibits and video short opened my eyes on what really happened here. Worth visiting as everyone has a different opinions. It was interesting but is a bit disjointed. This was a very good choice for us. Picked up from our hotel as promised. Our guide was very informative. She gave a good talk on the way to Pearl Harbor. When we got there we did not have to wait in line. All of our tickets were taken care of. This alone was worth it. Very happy with this tour. what ages require an ID? Children younger than 18 don’t need to show ID. Please note that IDs are very rarely requested at Pearl Harbor. Does this tour visit the monument for the USS Nevada? Like the USS Utah Memorial, the USS Nevada memorial requires military access. The monument for USS Nevada is located at Hospital Point and there are not any tours that visit that site. 11 hours! Totally worth it though. I think I know everything abou the attack and can actually become a professor. lol. All joking aside I feel privileged that I got to learn about our fallen heroes. Our tour guide was hilarious and knowledgeable. If you’re coming to Oahu, don’t pass up this important moment in history. An amazing attraction. Very moving and historical. A definite “must see”. get there early as you won’t want to waste a minute of your day in this paradise. This memorial was much more than I expected, and I do recommend that every American pays their respects to those sailors of the USS Arizona. Booking on the official government web site must be done many months in advance. Not much parking if you bring your own car. Booking a tour bus is really the only way to get in since loads of people are bused in on the daily and tickets most likely won’t be available if you go yourself. 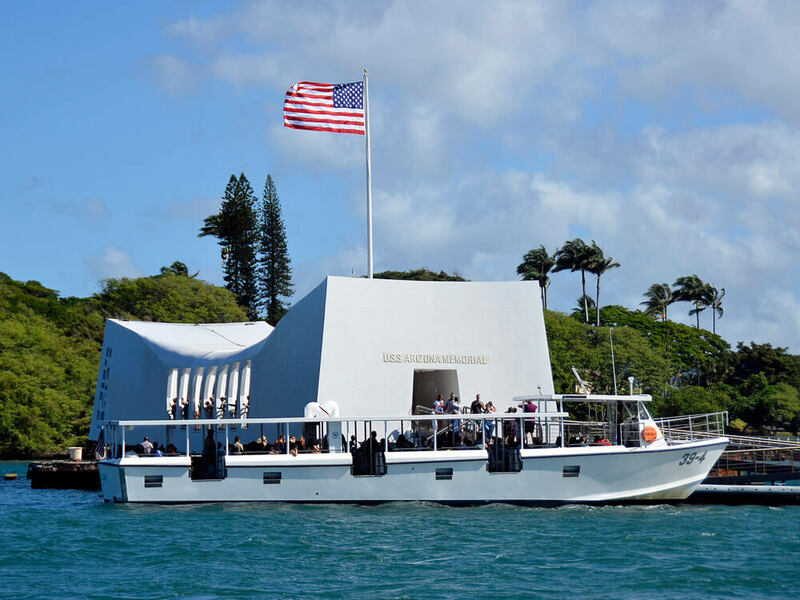 Excellent way to see the important memorials and museums around Pearl Harbor, including the USS Arizona, the USS Bowfin, and the USS Missouri. This tour is a MUST if visiting Oahu. They pick you up at your hotel and we felt like the guide knew everything! Learned some new facts about the attack. There was a lot to see, but we’re glad we did it. The most advanced multimedia expereinces await you at the all -new Pearl Harbor exhibits. Not only the launching point for the boats to the Arizona Memorial, the no-cost movie explaining the morning of December 7th, 1941 and what lead to that “day that will live in infamy.” Pearl Harbor is part of History and should be seen by all.